CHICAGO—When VonKisha Adams first raised the lid of the white box containing 50,000 bees, she almost screamed as they swarmed around her. But now, less than a year later, she’s used to the sound of buzzing, doesn't mind when the bees crawl on her protective jacket, and enjoys the sticky feel of honeycomb as she removes it from a hive. Employees in the program work 30 hours a week for 90 days, completing a process that includes tending the bees, extracting honey, bottling honey and honey-based skin products, and shipping them to stores. They also get job training, credit counseling, and other services to help them get their life on track. At first, it seems ridiculous: Fighting recidivism with bees? That's what Brenda Palms-Barber, the program’s founder, thought when a "tree-hugging friend" suggested the idea. But it’s been an unlikely success. Graduates of the program have a recidivism rate of only 4%, compared with the national average of 40% and the state average of 55%. Unlike many other social enterprises, Sweet Beginnings is also profitable, bringing in a tidy $9,000 last year. Brenda Palms-Barber, with beehives in the background. She started the program in 2004 with $114,000 seed money from the Illinois Department of Corrections. Since then, it's employed about 400 ex-cons, almost all African-American and most who were convicted of drug offenses. The business runs 131 hives in total, in the neighborhood and on unused property owned by O’Hare Airport. “Beekeeping is a profession that is passed on through storytelling or conversation,” Palms-Barber said—you don't need to read a textbook or get a degree to do it. And putting Sweet Beginnings on your resume has a way of rerouting a job interview. Instead of focusing on an applicant’s criminal history, the interviewers are fascinated by the unique experience. Bees? Yes, bees. Before he joined Sweet Beginnings, “I never worked a day in my life,” said Johnny Patterson, 44. 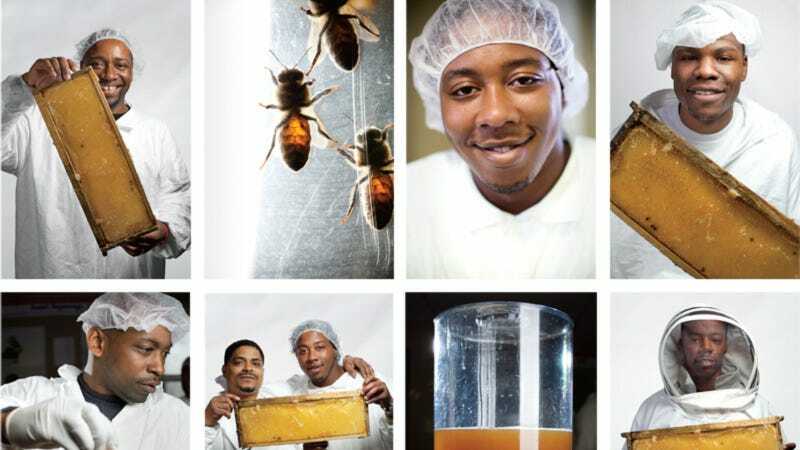 A job isn't the only change he's made since then: “Now, I eat honey on everything,” he added. If any neighborhood needs a business like this, it's North Lawndale. More than 57% of adults in the neighborhood have had some interaction with the criminal justice system. About a fourth of the 45,000 people released from prison each year in Illinois go back to five zip codes in the Chicago area. One of those is North Lawndale. From the outside, the Sweet Beginnings building—the home of its parent nonprofit, the North Lawndale Employment Network—looks like any other house on its small street, a couple blocks from an expressway. What makes it special is in the chain-link fenced backyard: 25 beehives in small white boxes. Cristian Petre removes a block of honeycomb from a beehive. On a chilly morning last week, Cristian Petre, a Romanian immigrant who’s a professional beekeeper, trained the employees about how to handle the hives. “They’re lazy,” Petre said of the bees. Temperature has a lot to do with their behavior. Hives that remain in the shade of the house were near-silent, while bees in the sun buzzed around. It’s hard for the bees to survive the Chicago winter: About 60% of hives die out and need to be replaced, and each hive has 40,000 to 60,000 bees. “I think God made the bee before us, because all things bees produce are beneficial for us,” Petre said. But humanity’s effect on the environment could leave drastic problems, he added. “If we continue to destroy the environment, the bee is going to die. And if the bee dies, I think we follow.” Everyone at Sweet Beginnings is well aware of colony collapse disorder, and the threat it proves not just to their business model but to our global food chain. When they're working, employees wear white jackets with mesh veils that cover their heads. Everyone's terrified at the thought of getting stung at first, but they soon learn that if you don’t mess with the bees, they won’t mess with you. The house is cramped, with low ceilings and floors in the middle of being ripped up for a renovation and expansion. In the kitchen, bay windows look out on the backyard, and employees treat honey and prepare it to be sold. Dressed in a bee-colored sweater with a blue hairnet covering her head, Adams carefully slid a hot knife up the blocks of honeycomb, slicing off the sheets of wax that cover the honey. It steamed as wax slipped off, with liquid honey dripping into a container below. As she worked, Adams explained how Sweet Beginnings had changed her life. Two years ago, she was arrested for selling drugs, and she just got out on parole in December. She returned home to North Lawndale after a year in a prison in downstate Illinois, 150 miles away, and was given nothing more than a few dollars and a ride back when she got out. Adams knew she didn’t want to keep doing what she did before, but she wasn’t sure how to escape her old life. And then her sister told her about Sweet Beginnings. During her 90-day training program, Adams learned how to make honey, but she also got help composing a resume, finding a permanent job at the Chicago Transit Authority, and building her credit. After Adams graduated, Palms-Barber hired her part-time to give product demonstrations to new stores that might want to sell Sweet Beginnings products. And she’s good at it. “Coming from the streets, I’ve learned to deal with a lot of types of people,” Adams said. VonKisha Adams cutting wax off honeycomb. Her knife shivered up the honeycomb, filling the room with the fragrant smell of honey. Some honeycombs are dark, opaque, mysterious; others are light and golden—it has to do with the weather and the time of season. Then she carefully loaded the honeycombs into the extractor, a centrifugal machine that will spin them at high speeds to coax the pure, liquid honey out. Palms-Barber also has an affinity for bee puns: “We want to pollinate this model across the country,” she told me. “We take the sting out of incarceration,” she added later. A finished brick of honeycomb is solid on the top, with golden liquid below, a mixture of crunchy and smooth, deliciously sweet. Honey has a low profit margin—only about 13%—but the employees also make other products with honey in them, including shower gel, lotion, and lip balm. Those have higher profit margins, 80 to 300%. Finally, they ship the products around the city, to be sold in about 10 Whole Foods stores and a local supermarket chain. In the future, Palms-Barber hopes to start a franchise model with similar companies around the country: Sweet Beginnings D.C., Sweet Beginnings Detroit, and so on. She also hopes to make the jobs full-time, and expand them past just 90 days. She's not the only one who has big plans. “My whole outlook on life has changed,” said Patricia Jackson, another employee. ”Every day I wake up, I am glad to come to work.” As she comes to the end of her time in the program, Jackson, 35, is working to launch her own business, a local catering company. She wants to hire people in the community—and use honey in her food. “North Lawndale is really special because it’s more welcoming and open than other places,” Jackson said. While there are a lot of abandoned buildings, she wants to take one and open a restaurant in it someday. That ambition, she and her co-workers say, is based on the sense of accomplishment they've learned from the honey. Sweet Beginnings was one of the local organizations that invited visitors as part of Chicago Ideas Week. Univision, one of Fusion’s parent companies, is a sponsor of Chicago Ideas Week.